It is coming. It is almost here. The Year of The Rooster is almost upon us. 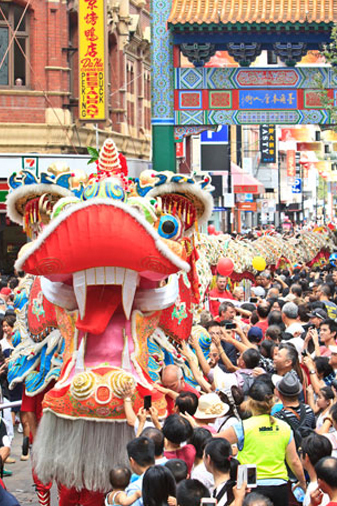 Melbourne Chinatown has prepared many activities, events and showcases to celebrate this colourful holiday with locals and guests. Make sure you get to Chinatown on one of the days of the celebration season to see, to smell, to enjoy and to marvel at anything and everything Chinatown and Asian culture has to offer. From 23 to 29 January Melbourne Chinese New Year Festival's organisers have done their best to cater for a wide range of tastes and audiences, from kids to adults, from local to tourists. The Festival prepared many gifts, competitions, attractions and shows to celebrate the coming of the Year of The Rooster. Throughout the festival, God of Prosperity will honour guests with his attention at Emporium. Roving performers will entertain you throughout Chinatown. Also, you will be able to test your mathematical and problem-solving skills guessing a number of Chinese Fortune Cookies in one of the cookies towers in Shopping Arcades. The main events of the festival will take place during the weekend 27-29 January, with New Year officially starting on 28th January 2017. Little ones will be entertained by performances on Children Outdoor Stage in Cohen Place. Their parents will be able to buy a lantern, make a wish and hope for it's coming true at The Lantern Wishing Tree. If you are a foodie, you are welcome to join in Chinese New Year Eve Feast – an outdoor dining experience. Later at night Chinatown Square Lighting will brighten the waiting for the Chinatown Countdown to New Year, with the actual countdown starting at 11.30 pm and Chinese Lions bringing in New Year. On Sunday 29 January Chinatown welcomes you again to celebrate the new year with Chinatown Festival Opening and Dragon Parade through Chinatown. Come and watch Chinese Lions blessing businesses for the year to come, give your blessings to Buddha at Fo Guang Shan Temple, browse hawker stall and participate in cultural workshops. Kids will be able to make their own dragon mural at Chinese Musem which will open its doors to visitors for the whole day on Sunday. All events are family-friendly and FREE. Bring your family, your good mood and positivity. Enjoy the festival and have a prosperous new year.